Acid test: Is Zadorov ready to be — and stay — a top-pair “D”? Amid the disaster that was the Avalanche’s 2016-17 season, Nikita Zadorov’s progress, especially noticeable in the first part of 2017, was was one of the signs that maybe … just maybe … there was hope for the future. I’m not going to get carried away here and say it was obvious the Russian defenseman was on the verge of stardom until he suffered a fractured ankle in late February and was done for the season. Indeed, the Moscow native’s play was mercurial, as it has most been since his acquisition in the 2015 trade that sent Ryan O’Reilly and Jamie McGinn to Buffalo. His big hits — and there were many — drew involuntary exclamations, then cheers. Then then his mistakes — and there were many, both physical and brain-lock — were reminders: Zadorov then still was only 21, green territory for all but the most precocious NHL defensemen. 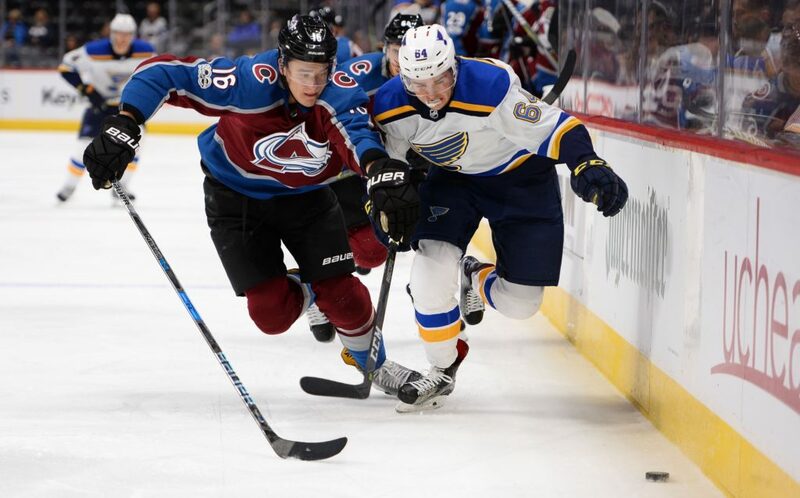 After signing a two-year, $4.3 million contract as a restricted free agent in mid-September and reporting late, Zadorov is back in the Avalanche’s top pairing with Erik Johnson. They also played together early last season before Johnson suffered a broken leg, and when Johnson returned, Zadorov was out. Johnson is playing an eye-popping 26 minutes a game heading into the Avalanche’s Tuesday home game against Dallas, and Zadorov is at t 17 minutes. But he’s in that top even-strength pairing and has one goal and one assist in seven games. The Avalanche has lost three in a row after a 4-1 start, and the test now is to avoid having this become reminiscent of a year ago, when the 3-1 and even 9-9 early records turned out to be fleeting competence. Zadorov has struggled in recent games, leading to renewed challenges to him from the coaching staff, including Jared Bednar. “He’s got to be better, for sure,” Bednar said. “He’s one guy that has the ability to play in that shutdown role with E.J. It’s tough to log the minutes E.J. is logging right now, so it’s got to be done by committee. He’s averaging 26, 27 minutes a night and (Tyson) Barrie is right there, I think at 23 a night. So those guys pick up a lot of the right side minutes and we need some guys to play with them. Bednar welcomed Zadorov’s increasingly physical play last season. He is, after all, 6-foot-5 and 230. “The base of his play has to start with the physical presence and making sure he’s moving his feet and making simple puck plays,” Bednar said. “I think he can better. We’re putting pressure on him to be better. If you look at last season, he came out slow and he kept building and building and I thought he was playing a real solid, top-four defenseman game for a stretch. I don’t know what it was exactly, 10, 12 games, and then he got hurt. . .
Zadorov pointed out that that he wasn’t drinking Mai Tais on South Beach when he was working out under a trainer in the Miami area in the off-season. He said conditioning isn’t a problem. Zadorov said he hadn’t backed of the hitting. And, yes, he’s only 22. The original “O’Reilly Trade” was Avalanche receiving Mikhail Grigorenko, Zadorov and J.T. Compher, plus a second-round pick from the Sabres. Grigorenko was a quiet — in several ways — washout in two seasons here and is playing in the Kontinental League, back home in Russia. There have been offshoots since, primarily involving Colorado trading that pick to San Jose and using other picks that came back to take A.J. Greer (second round) in 2015 , Cam Morrison (second) in 2016, and Denis Smirnov (sixth) in 2017. Greer also is with the Avs now, and the other two are college sophomores — Morrison at Notre Dame and Smirnov at Penn State.